In our alternative history setting The Second Great War, the nations of the world are at war in 1940, but not in the same manner as in our own reality. 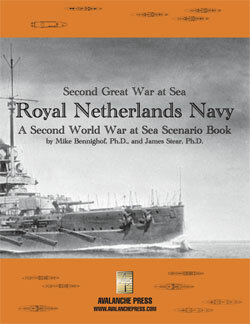 Royal Netherlands Navy is the third volume in the setting, this time adding the Dutch to the mix. In the war’s first year, heavy fighting in the Atlantic and the Mediterranean involved Germany, Austria, Turkey, Italy, France and Britain. The United States remains neutral; Imperial Russia has been a driving force of the unprovoked aggression by the Entente powers but so far we have not covered Russian naval actions. The Dutch also remained neutral through the war’s first year, but stresses appeared. A “mistaken” French nighttime poison gas attack against Dutch civilians brought the Netherlands to the brink of intervention on the side of the Central Powers, but the Queen’s government urged restraint. The Dutch merchant marine, scattered around the globe, would become easy and lucrative targets for the British Royal Navy. To appease the interventionists, and protect Dutch trade, the Royal Netherlands Navy began convoying merchant ships between the home country and American ports. As German firms began importing huge amounts of American grain, iron ore, cotton and other raw materials via Dutch shipping and ports, the British Admiralty looked to close off this massive loophole in their attempted blockade of Germany. Asserting the right to limit Dutch imports, the British demanded an end to the trade. With one-third of all Dutch employment dependent on trade with Germany in one form or another, the Dutch government could not comply without risking economic collapse, and after the poison gas incident, the Dutch had little desire to do so. The Royal Netherlands Navy received orders to defy British seizures with force if necessary. With Winston Churchill in charge at the Admiralty, the inevitable incident eventually came to pass, with a Dutch cruiser-destroyer force fighting a fierce night action in the English Channel against a similar British force. By the summer of 1941, Britain and the Netherlands were formally at war. Fighting quickly spread to the Netherlands East Indies, where the Dutch fleet soon drove the over-aged British battleships of the Eastern Fleet away from Singapore. That’s the situation when Royal Netherlands Navy opens: naval war in the Dutch East Indies against powerful opponents. The Dutch have a strong fleet of their own, but face a decidedly difficult task in the East: their allies can provide little assistance and the British and French have a huge preponderance of force. But as in the Mediterranean theater, as shown in The Habsburg Fleet, there is no combined Entente command and Japanese adherence to the alliance is clearly only a matter of convenience. Royal Netherlands Navy is focused on the South-East Asian theater, drawing on the Second World War at Sea boxed game Strike South for pieces and maps. It has the sheet of pieces from the old Spice Islands “zippy” supplement, plus an additional new half-sheet with British, French, Japanese, German and some more Dutch pieces. Including some airships, because those are becoming a standard feature of the Second Great War at Sea. As a game designer, the challenge here was to fit a pre-existing set of pieces (Spice Islands) into a framework for which it was not designed. That seemed pretty daunting at first, but melding them into the story line actually turned out to be the easy part. Jamming everything into just one book turned out to be a lot harder, and with two pretty much separate story lines going on (Europe and the East Indies) I eventually split the story into two works. There’s a lot of action and a lot of hardware, and it could be even more. Royal Netherlands Navy has some similarities to The Habsburg Fleet; it’s structured in a similar manner (with scenarios taking place along a timeline of events), the battleship is a more important weapons platform than in our own reality, and the pace of combat is a good bit higher than the actual Second World War at Sea (with the exception of the Japanese attack on the East Indies; the Japanese probably could not have stepped up their operational tempo any more than they actually did). In terms of the story line, the addition of the Dutch fleet to the Central Powers’ order of battle helps redress the balance of forces somewhat. Dutch intervention allows the German fleet to resume offensive operations in the North Sea and Atlantic; in terms of game strategy, I wanted the Second Great War to follow a different pattern than the Second World War. Likewise, the situation in the East Indies is a fluid one, with the Japanese taking a Machiavellian position of maximizing advantage for their own Empire, without giving even lip service to alliance responsibilities (except when those seem useful). This Japan has its own sources of Manchurian oil, so the need to take Dutch fields is less imperative than the desire to forestall British or French occupation of the island chain. The Japanese have to start further away (the French remain in control of Indochina) and thus have a harder time using land-based air cover for their operations. The British, on the other hand, have a major base smack in the middle of Dutch waters. They will need to force through reinforcements and supplies, while the Dutch will want to neutralize this dagger aimed right at the heart of their eastern empire. Meanwhile, just as in The Habsburg Fleet, the French are looking to gain influence through the timely application of their own limited forces. As long as the fans enjoy the Second Great War setting, and they most definitely seem to do so, we’ll continue the story. The Second Russo-Japanese War still remains to be described, and the German-Russian conflicts in the Baltic and the Arctic, the tale of the Russian Black Sea Fleet and the Turkish adventures on the Red and Black Seas. And that’s just for the first year of the war. Click here and order Royal Netherlands Navy right now. Mike Bennighof is president of Avalanche Press and holds a doctorate in history from Emory University. A Fulbright Scholar and award-winning journalist, he has published over 100 books, games and articles on historical subjects. He lives in Birmingham, Alabama with his wife, three children and his dog, Leopold.